Modular Engineering – Design permits quick and easy mill chamber interchangeability with various mill head profiles to support multiple demands for a wide range of formulations. High Shear Precision – Fine tuning of applied mechanical shear is achieved through a micrometer style gap adjustment dial. Milling speed can also be controlled by an optional variable frequency drive. Temperature Control – The mill chamber thermal jacket provides the ability to manage milling temperature during the milling process. Thermal jackets are standard in Bematek mills. Rotary Safety Stop – The milling chamber has an optional positive stop mechanism that will never allow the conical rotor to contact the stator, when making gap adjustments at operating speeds. 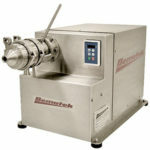 Colloid Mill Chamber Simplicity – Fewer major milling components means ease of use and lower maintenance costs. Mill heads can be exposed by removing only two parts. With only four major components, the entire mill head can be rapidly maintained and reconfigured for various applications. We Listen. We Solve. We Deliver.